The Keen Detroit work boot has a versatile medium-profile design that supports and protects every inch of your feet. So comfortable and easy to wear, you just might forget to take these work boots off once your shift is through. 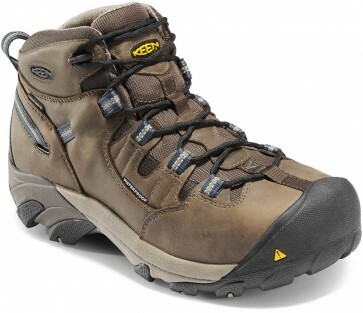 The KEEN Patented Toe Protection, where the shoe outsoles wrap up and over the toes, provide ultimate protection. Rubber: Non-marking oil and slip resistant rubber outsole.